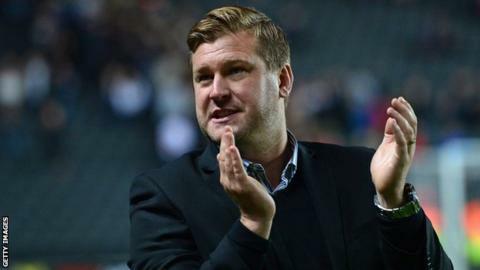 MK Dons boss Karl Robinson expects increased interest in his players after their 4-0 win over Manchester United. The League One side caused a massive upset with the League Cup second-round hammering of the Premier League giants. "We believe the phone will ring over the next 48 hours," Robinson told BBC Look East. "But we have to make sure we keep our best players here. It will get more difficult because that was not a big stage, it was a world stage." MK's goalscorers on the night, Will Grigg and Benik Afobe, are both on loan, but forward Ben Reeves put in a star performance with three assists, while 18-year-old Dele Alli was superb next to Darren Potter in midfield. "The enormity of Manchester United has allowed these players to catapult their careers," said Robinson. "We're not chasing the money, we don't need to chase the money. We're in a good position. So hopefully we can keep all of our players."